We chose NCL because we cruised with them once before and really enjoyed our experience. At the time of booking they were offering a great promotion, which made the trip much more affordable and we think a balcony room makes the trip more comfortable and enjoyable. Once again, the service of all the cruise staff was incredible. They work so hard and are so pleasant. We did get a bit tired of the food. After a while it all tasted the same. We booked one NCL shore excursion, as we did last time. It was very good but a bit rushed. I&apos;m grateful for discovering CruiseCritic where I discovered useful excursion information, joined an excursion with a group on our rollcall and started an ItalyTourSharing excursion which turned out to be fantastic. It was just what we wanted, our guide/driver Luca, was exceptional, and the family we shared the trip with was wonderful. It was the best excursion we ever had. Bonus, it was far less expensive than the NCL tour. We stayed in Barcelona for 3 days before embarking on the cruise which turned out great to get over jet lag, and explore the city and sites at a more leisurely pace. 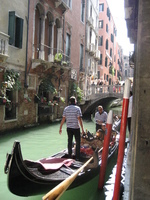 We also booked 3 days in Venice at the end of the trip which was equally wonderful. It&apos;s really nice to have some extra time in a city after all the one day visits. The Norwegian Spirit is an older and smaller ship in their fleet but it was still nice and I wouldn&apos;t let the age or size stop me from booking the destinations I want at the time of year I want. May offered largely good weather but I found September was even better. We chose NCL because we cruised with them once before and really enjoyed our experience. At the time of booking they were offering a great promotion, which made the trip much more affordable and we think a balcony room makes the trip more comfortable and enjoyable. Once again, the service of all the cruise staff was incredible. They work so hard and are so pleasant. We did get a bit tired of the food. After a while it all tasted the same. We booked one NCL shore excursion, as we did last time. It was very good but a bit rushed. I&apos;m grateful for discovering CruiseCritic where I discovered useful excursion information, joined an excursion with a group on our rollcall and started an ItalyTourSharing excursion which turned out to be fantastic. It was just what we wanted, our guide/driver Luca, was exceptional, and the family we shared the trip with was wonderful. It was the best excursion we ever had. Bonus, it was far less expensive than the NCL tour. We stayed in Barcelona for 3 days before embarking on the cruise which turned out great to get over jet lag, and explore the city and sites at a more leisurely pace. 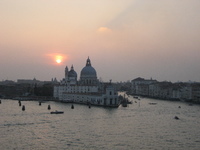 We also booked 3 days in Venice at the end of the trip which was equally wonderful. It&apos;s really nice to have some extra time in a city after all the one day visits. The Norwegian Spirit is an older and smaller ship in their fleet but it was still nice and I wouldn&apos;t let the age or size stop me from booking the destinations I want at the time of year I want. May offered largely good weather but I found September was even better. Love having a balcony and the location was quiet. This room wasn&apos;t as nice as the one on the Norwegian Jade which is a newer ship. A great day with a wonderful driver. He took us to the sites we selected including the Acropolis and down the coast to the Temple of Poseidon. I went swimming at the beach just below the temple and then we all had a snack at the seaside restaurant. Our driver showed us a few gems that he knew about which were lovely. We started in Barcelona and spent 3 days there. It&apos;s a beautiful city with lots to see. Used the metro and hop-on-hop-off. Both were great. Our family of three shared a taxi with two others and we went to Pisa and Lucca. Both cities are lovely and lots to see and enjoy. This was really a pleasant day and very affordable. We didn&apos;t go to Florence because the day we were at port some of the main attractions were closed. Naples was a real disappointment. After researching all the great sites to see, many of which were listed by the city Hop-on-Hop-off, we found that everything was run down and closed. Even a museum with great works of art was not open. Churches could only be seen from the outside, were poorly maintained and sometimes gated. The city is an eyesore. Nothing is maintained. What a loss. I would definitely go on one of the excursions next time and see something worthwhile. Toulon itself was a bit disappointing but we took the NCL excursion to another port city, Sanary and hilltop city le Castellet. Both were very lovely.